More and more showers are made “barrier-free” not only in hospitals, nursing homes and retirement residences but also in private homes, where steps are increasingly being eliminated and obstacles avoided. 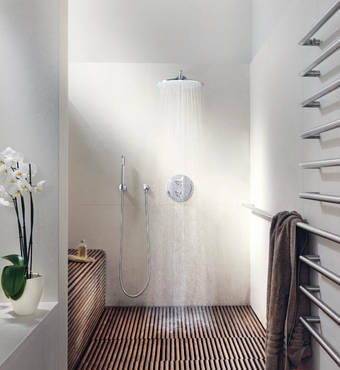 Floor-level showers that are easy to access are becoming the norm in many places and offer greater user comfort. The same applies to the shower faucets. The simple and intuitive operation of a shower is usually taken for granted when planning a bathroom. Consequently the special needs of different user groups are often not considered adequately. For elderly people, in particular, it is important that they do not need to learn the operation of their shower in a lengthy process but that it becomes second nature to them. In this context, important protective precautions need to be taken into account, e.g. regarding non-slippery surfaces and the correct handling of faucets and showers. Health hazards resulting from scalding as well as unintentional misoperations must be avoided to the extent possible. A sudden change in the water temperature is always unpleasant and can startle the user, no matter whether it is caused by misoperation or by a pressure change in the water supply. Especially elderly people, who usually need more time to react, may get a shock and lose their balance – which is a major health hazard. Smaller children who are unfamiliar with the water control and very sensitive to extreme temperatures need to be protected just as well. This means that the needs and requirements of people from different generations who live together in the same home must be reconciled to ensure safety and comfort for all. GROHE has given much thought to these issues and incorporated its findings into the design of its products in order to ensure maximum pleasure for everybody in the long term. In keeping with “Universal Design” or “Transgenerational Design” standards, the shower thermostats, for instance, have been equipped with easily readable scales for temperature and water volume to ensure that poor vision, for instance, does not become a handicap. Allowing people to age in place while benefiting from the latest technology that meets their needs and demands at any given time is one of the main objectives of our product development process. This ageing-in-place calls for the operation of a device to follow a “natural logic”, e.g. with regard to the direction in which a control is turned. This has been examined in comprehensive tests and put into practice in our products. Thermostat fittings from GROHE are especially recommended when it comes to ensuring protection against scalding, as they offset potential pressure fluctuations in the water supply automatically and in fractions of a second. The GROHE TurboStat® technology ensures that the perceived water temperature remains constant at all times. 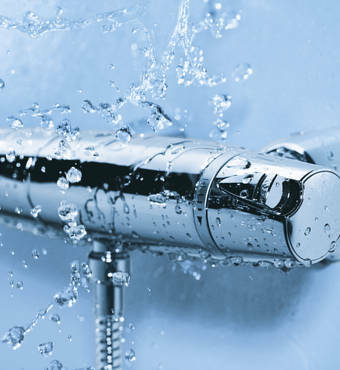 If the cold water supply is interrupted, our thermostats immediately stop the water flow. This largely protects users against injuries from hot water flowing from the overhead, hand or side showers. The GROHE CoolTouch® technology is a special benefit of our products. To protect users against scalding, GROHE CoolTouch® shields the outer surfaces of faucets, exposed pipes and hand showers from the hot water channels inside. The Transgenerational Design approach is also reflected in the GROHE SilkMove® technology, which facilitates the precise operation of single-lever mixers. The long shower rails are another illustration of this school of thought, as they allow the hand shower to be fixed at exactly the right position, irrespective of the height of the child or adult using it. These are just some examples of ideas that help GROHE make its product user-friendly for all user generations of users. We would be pleased to explain all the benefits in detail – simply contact us.